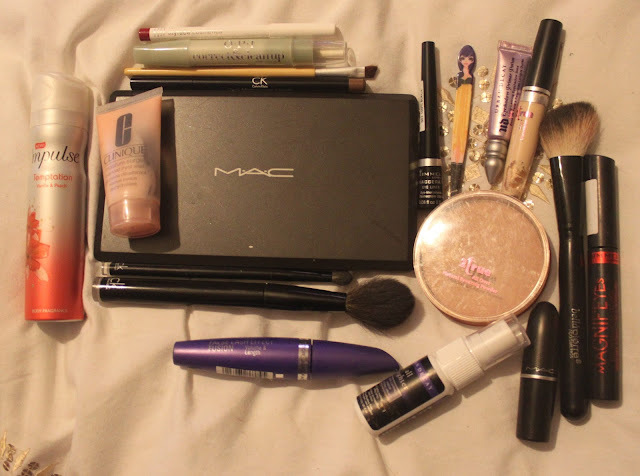 The Mermaid Life: WHAT'S IN MY MAKEUP BAG? What in my make up bag? Today I thought I'd show you what I took to my boyfriends. I don't actually have a make up bag, I have a few make up boxes, and the usual everyday make up that sits on my desk. My everyday make up is usually minimal, and changes again at night if I'm heading out anywhere. Here's a list of what I take around with me, and a reason to why I take it. MyFace Cosmetics Lip Liner for fair skin in Berry. I use this to line my lips - I HAVE TO LINE MY LIPS. I also use it for touch ups throughout the day if I decide to wear red lipstick. OPI Correct and Clean up. This is a god send. I bring it everywhere, just in case I see that I've over done the nail varnish. It's even refill able, so sometimes I use it to remove the remains of nail polish with a tissue. Angled Brush by Ecotools. I use this to fill in my eyebrows. Calvin Klein Brow Definition. I use this to touch up my brows. Clinique Moisture Surge. I HAVE to use it before I put my make up on. I don't use foundation during the day, so this is great to make my skin look brighter. I've also done a review here: Clinique Review. Impulse Temptation. Just because it smells good. Mac Palette. It's not completely full, only has 6 shades. But it has two shadows for my brows, two high lighters, one for lining my eyes and one shimmery shade. It's everything I need in one little palette. Rimmel Exaggerate Eyeliner. It's just perfection! Cute little tweezers! I love cute things and I love these tweezers! Every girl needs to carry around tweezers. They're not just for your eye brows, but every day things. I'm always reaching for them. Urban Decay Primer Potion travel size. I have the full size in my make up box, but this is perfect for on the go. I use it whenever I apply shadows. Calvin Klein eye shadow brush. I love this brush! It's so fluffy and does the job perfectly. Calvin Klein powder brush. I love this for giving me a sheer cover of blusher/powder foundation. During nights out I don't like a face full of foundation so this is perfect. And gives my cheeks a lovely wash of colour. 2 True Bronzer. This is really lovely on my skin tone. I'm so pale so I want something soft and warm, and this bronzer does just that. Not too heavy at all. Bellapierre Angled Blush Brush no36. It's perfect for a more stronger wash of colour. It's the opposite feel to my CK powder brush. It's more dense and carries more colour onto my cheeks. Max Factor False Lash Effect Mascara. All Max Factor mascaras are a godsend! Rimmel Magnifeyes Mascara. One of my favourite Mascaras at the moment! 2 True 2 in 1 Concealer. My favourite concealer at the moment. I find most high street brands don't go very pale, and this is perfect. I love this, it's perfect for my skin and covers what I need it too. Mac Lipstick in Russian Red. My favourite red lipstick at the moment, and it's matte. Stays put forever! Urban Decay All Nighter in travel size. I only tend to use this when I have foundation on, so before shows, before going out etc. Really works a treat. I got this given to me by the amazing Holly from Holly Arabella UK Beauty Blog which was so lovely of her. I'll do a review soon - It's amazing! So there we have it! My daily make up that I take to places. When I'm going out to events I use the make up from my make up box. It has everything in there including foundations! If you're a beauty blogger, I hope this persuades you to do one yourself. If you're just a reader let me know in the comments how you find these products if you've used them. Thank you for reading!